​An efficiently heated pool lets you extend your swim season and provides luxurious comfort that fits your lifestyle. Pool heaters run either on solar energy, electricity or gas (natural gas or propane). Those that run on electricity are also known as heat pumps. 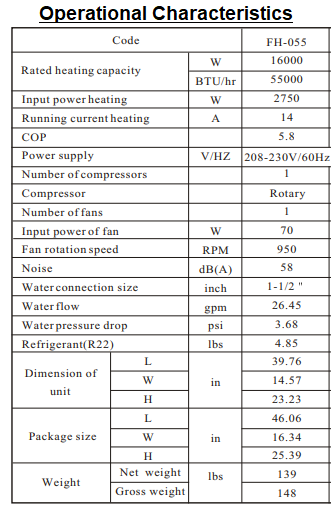 If you have decided to get a pool heater, you will first have to decide which type to get. To help you in your decision, we will present in this article three of the most popular and best rated pool heaters bought by Amazon customers, one of each of the three types. These were not just the most popular among Amazon customers at the time this article was written, but they had also received excellent reviews from most Amazon buyers (an average of at least 4 stars each out of 5 stars!). By using the UV rays from the sun to heat your pool, you can both save some money on monthly fuel costs and extend your swimming season, so you can take advantage of your pool for a longer period. The SMARTPOOL S601P SunHeater can be used to heat your pool using the power generated by your existing pool pump and the sun's UV rays. It is made in the United States, and it comes with two solar collector panels made of durable heavy duty polypropylene, each measuring (2' x 20'), for a total of 80 sq.ft of solar panels. The panels can be installed on the ground, on the roof of your home as long as it is not too far from the pool, on a rack, or even on the surrounding fence. ​Warning (for those who want to install the panels on a roof): Unless you are familiar with working on roofs and have the proper ladders and safety equipment for such work, you should hire someone with the necessary experience to do the installation. Failure to observe safe practices on a roof or other elevated structure may result in falling, leading to serious injury to you. When properly installed with the correct number of collector panels required by your pool's size, you can raise the water temperature about 6-10°F (4-6°C). Note that the tough polypropylene material of the panels won’t rust, corrode or scale. In addition, the collector panels are reversible extending considerably their use. ​If your pool pump is in good working condition, there shouldn't be any problem using your existing pump. A 1hp pump will handle installations up to 30 feet away from the pool equipment and one story up. If the collectors are cool to touch when the water is running through them on a warm sunny day, you are getting enough flow. You can place the collecting panels anywhere you get at least 6 hours of full sun during the day. The longer the collectors are in full sun, the better they will work. If you are mounting them on an angle (like on a roof or a rack), the collectors should face a southerly direction. ​Though some connection hardware is included in the purchase, it's recommended to purchase the SK21 System Kit to complete your installation as it contains some important mounting and plumbing hardware (for a detailed content of the kit see below). A single System Kit can be used to install up to 4 boxes of S601P. An installation manual is included so you can do the installation yourself. Note that the product comes with 5-Year limited warranty. You can also extend your swimming season using a large-capacity electric pool heater (also known as a heat pump). Fibroheat's FibroPool FH 55 has an output of 55,000 btu per hour and is rated to heat above-ground pools that are up to a 21′ round or up to a 15′ X 30′ oval, and inground pools of up to 10,000 gallons. It can be used for inground pools that are 450 sq-ft or less. The unit is 14.5 inches wide, 39.7 inches long and 23.2 inches high, and it weighs around 139 lbs. ​The way it works is that the heat pump of the unit absorbs heat from the air and transfers it into the pool water, but it needs to use your pool pump for water circulation. It is therefore installed in line, after the pool pump and after the filter, but before the chlorinator/salt system (if your pool has one). It must be hard wired (20 amp & 220 volt required). ​For proper installation, the pool heater unit must have a clearance of 12 inches all around, 12 inches vertical, and 36 inches on the side of the service door panel. It uses a Copeland high-pressure differential rotary compressor and a 100% titanium heat exchanger which makes it completely corrosion-proof. You can use it both on salt water and fresh water pools.​ All-metal, enamel coated case will last year after year and withstand the elements. Easy set digital display and controller allows for quick adjustments from the unit. It comes with a life time warranty for the titanium heat exchanger coils, 10 years for the compressor and 3 years for electronic components. For an average-sized pool with cover (whether solar, plastic or liquid pool cover), it will cost roughly 20 dollars a month to keep the water around 82 degrees F. You should see an increase of about 5-20 degrees per day, with the heater running on daylight hours only (the exact numbers will depend on the pool size and the weather). Recognized as an Energy Efficient System by the US Department of Energy. - Pentair MasterTemp 460730 which runs on natural gas. 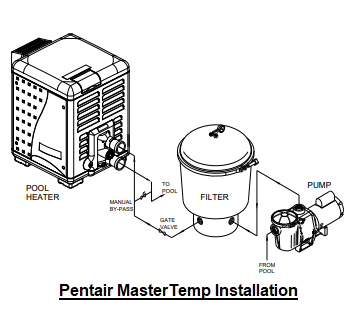 - Pentair MasterTemp 460731 which runs on propane. Except for the type of gas type they use, the two versions come with similar features, and when properly installed, these heaters work fast and efficiently without taking away from your pool's aesthetics. Note: Before installing the gas line, be sure to check and confirm which type of gas (natural or propane) your heater was designed to burn. This is important because different types of gas require different gas pipe sizes. The rating plate on the heater will indicate which type of gas the heater is designed to burn, and the installation manual specifies the related pipe sizes. ​These heaters require no pilot flame, and they are easy to operate thanks to the digital controls and the user-friendly indicator lights. Their compact design and quiet operation won’t intrude on your swimming and poolside enjoyment. Gas pool heaters burn the fuel (natural gas or propane) within a combustion chamber. The pool water that enters the heater, runs through heated copper coils rasing the water temperature, and returns to the pool warm. They feature a cupronickel exchanger that is highly resistant to corrosion and that can stand up to the harshest of applications, like low pH, high flow or heavy use. They have a tough, rust-proof composite exterior that handles heat and weathers the elements. They are equipped with a rotating digital display that allows easy viewing. - the stack flue sensor which shuts down the heater if the flue gas temperature reaches 480° F.
They meet strict air quality standards and they are certified for low NOx (nitrogen oxides) emissions as well as best-in-class energy efficiency. They measures 23.0”W x 32.6”D x 28.2”H inches. Note that Penter MasterTemp heaters comes in various sizes generating from 150,000 BTU per hour all the way up to 400,000 BTU. When you click the Amazon link for this heater provided below, you will be getting the 200,000 BTU units we have described above, but also other BTU sizes whenever other sizes are available. The three pool heaters considered here are excellent products as shown by the average rating each had received from Amazon customers at the time this article was written. Indeed, all three had received 4 stars (out of 5 stars)! Therefore, there is a good chance that you would be quite happy with any of these three products. Clearly, costwise, the solar option is the cheapest. Not only does the heater costs less than the other heaters considered here, but also solar energy comes free (but keep in mind that the system uses the pool's water pump for water circulation, meaning that there will still be some electricity cost associated with running the pump). On the othe hand, the electrical and gas heaters are equipped with digital controls that make running the unit much easier. Please click the pool heater of your choice below for price information or to purchase.